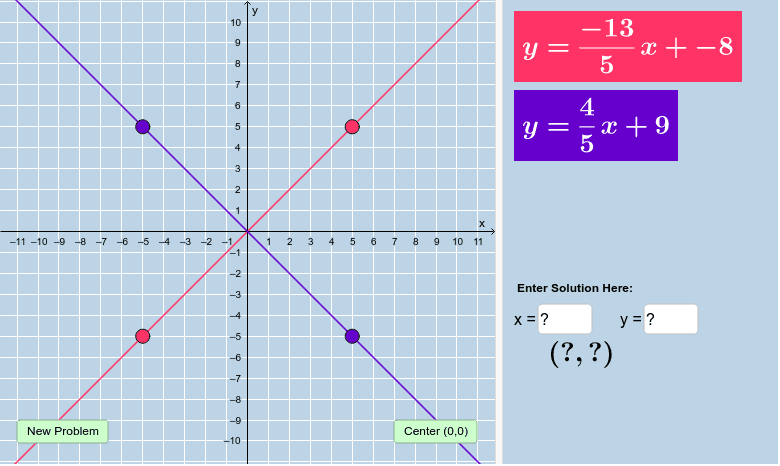 In the applet below, note the system of equations displayed. One equation is displayed in pink. The other equation is displayed in purple. Directions: 1) Move the pink points (of the pink line) so that this pink line becomes the graph of the pink equation displayed. 2) Move the purple points (of the purple line) so that this purple line becomes the graph of the purple equation displayed. 3) Enter the respective x- and y- coordinates of the solution to this system of equations. If you enter this correctly, the applet will confirm this. Repeat this process as many times as you need in order to master this concept! Note to Instructors: Applet generates problems for which coordinates of solutions are integers.